Sandy Bay’s collection of beautifully illustrated watercolor family trees depict genealogical information within a series of artful vines and hearts. Drawn to commemorate a marriage, and adding children among the fruit of the trees, they often included representations of the family home and livelihood. 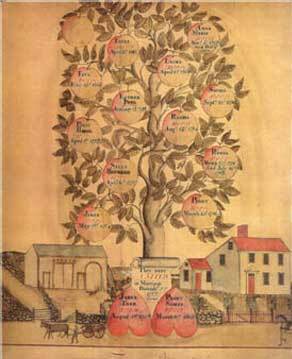 This tree was drawn by William Saville for the Jabez Tarr family around 1800.